English/Dutch which are used in salads and the Beta Alpha cucumber which is often used to make gherkins. The English cucumber grows to a size of between 25 and 30 centimetres in length whereas the the Beta Alpha cucumber grows to between 12 and 15 centimetres in length. When preparing your soil for cucumbers turn the soil over to about a spade's depth. Add organic compost and manure and mix this into the soil. Compost should have organic matter such as chopped leaves, hay or straw to enhance drainage. While turning your soil remove rocks, stones or clods of clay. 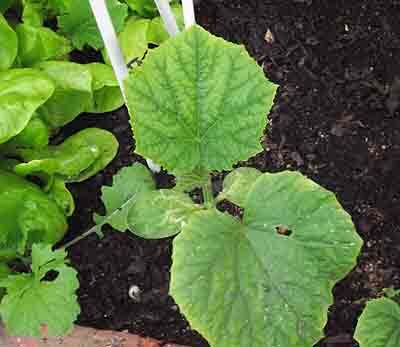 There are various ways to start off your cucumber seedlings. If your weather is still cold you can sow your seeds indoors in biodegradable seedling pots or otherwise use the cardboard egg containers you buy eggs in. By using the biodegradable material you ensure that the cucumber seedling's roots are not damaged when you plant them out. When planting cucumber seedlings growing in biodegradable boxes cut the egg boxes apart between the plants and plant the plant and the cardboard packet the cucumber is growing in directly into the ground. Do not take the seedling out of its packet as you will damage its roots. Plant the packets using the same distances as set out for the seeds below. Seeds can be planted directly into the ground. If you are using this method you should plant your cucumbers in rows. Make small mounds every 30 to 40 centimetres along the row and place two seeds in each mound at a depth of 2.5 centimetres. As cucumber seeds are pretty fussy as to how they are placed in the ground you should plant the seed with its radicle end (the end that the roots will grow from) pointing upwards. Planting the seeds in a different position to what I have described will still allow the seeds to germinate but you tend to get smaller seedlings. There should be a gap of about 40 centimetres between each seedling along the row. If you are planting more than one row of seeds there should be a gap of about 90 centimetres between rows. Cucumbers are pretty straightforward vegetables to grow. As they are vining plants and can grow to lengths of two metres they need the space advised above. Once they start growing they need to be trained to grow vertically up a trellis work or something that can support the vines. Cucumbers grow best when the cucumbers hang down when growing. The trellis work or stakes that you are using should be about two metres in height. It is recommended that you set up your trellis before the plants germinate as you could disturb the roots if you work around them once they have germinated. Cucumbers need to be watered at least twice a week for them to be firm and juicy. 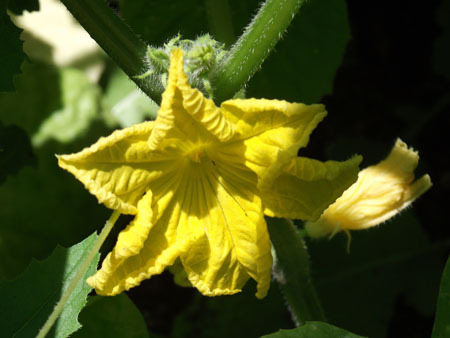 Cucumber plants have both male and female flowers like the pumpkin plant. The difference between the male and female flowers can be easily spotted as the female flower has a small cucumber at its base. The male flowers produce pollen which has to be transferred to the female flower by bees. If you want to ensure that pollination takes place you can by using a cotton bud to pick up pollen on the male flower and transfer it to the centre of the female flower. Feed your cucumber plants with 2.3.2 fertiliser every two weeks while they are growing. If your cucumber plant's leaves turn yellow it means that your plant is starving and needs food. Feed the plant immediately with 2.3.2 fertiliser to rectify the problem. Cucumbers are normally ready to be picked between 50 and 60 days after planting. At this stage the cucumber's skin will be dark green and the cucumber should be firm. If your cucumber turns yellow it means that the cucumber is overripe and will not be nice to eat. In cases like this gather the seed and dry it and use for your next crop. If you want to have a continuous crop of cucumbers you should practice succession planting by planting a new batch of seed every two weeks until the middle of summer. Many plants have their likes and dislikes as to who they like to grow with or not. Cucumbers grow well when planted with nasturtiums, radishes, marigolds, sunflowers, peas, beets, carrots, and dill. They do not grow well with tomatoes and sage. It's simple to grow cucumbers if you follow the steps listed above.